"Be yourself is about the worst advice you can give to some people." Tom Masson (1866-1934) was the Literary Editor of the old Life humor magazine from 1893 until 1900. 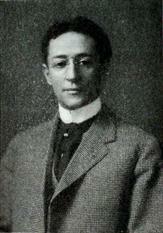 Afterwards he served as the Managing Editor until his death in 1934. Two years later, Time Magazine publisher Henry Luce bought Life Magazine just so he could get the title. During his years as editor, Masson was responsible for some of the brightest humor published in America, and his own writing stands as testimony to his sharp wit.